It is no secret that we love tacos! However, despite not missing a Taco Tuesday in almost 4 years, it has become tough to cook tacos at home with our busy schedule. When we were approached by Simply Organic to create a recipe we were beyond excited. 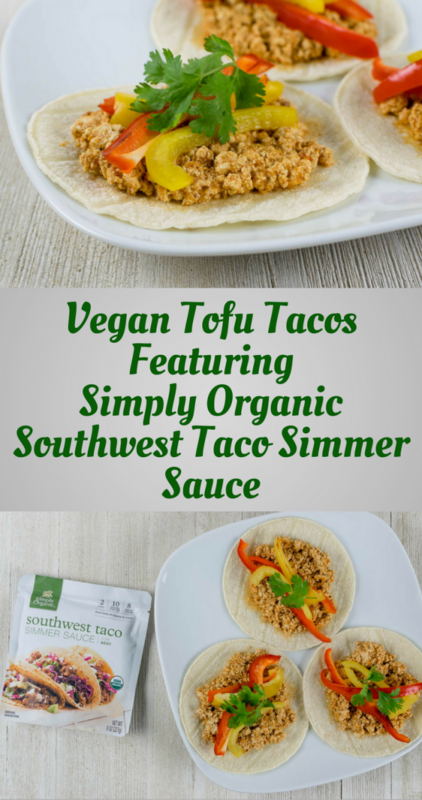 Finally, we could create a taco recipe that was not only delicious, but healthy and quick as wel! When we were creating this recipe, we wanted something simple but full of flavor. 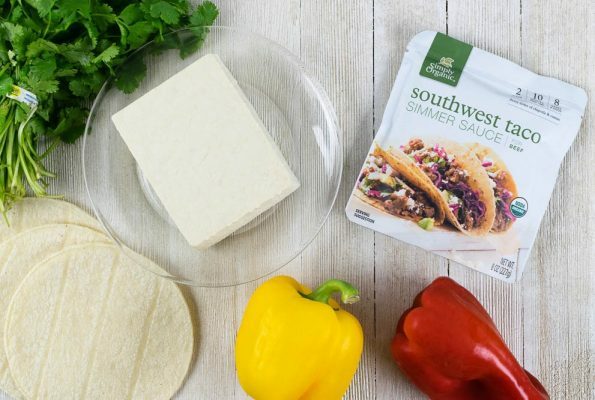 Using fewer ingredients helped to not only keep the recipe easy, but also highlight the Southwest Taco Simmer Sauce. If you are trying to watch your carbs or calories, the tortillas can easily be substituted for lettuce wraps or a salad. 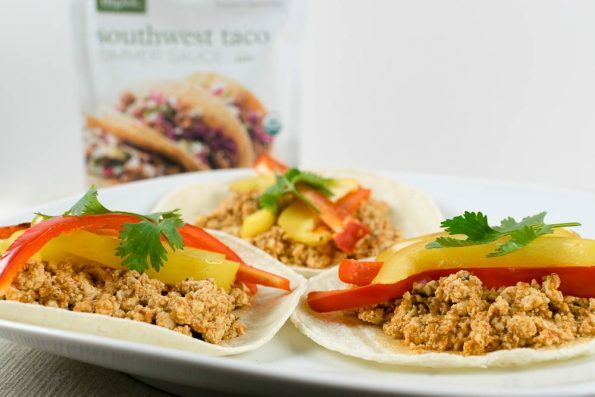 Another great thing about the tofu taco filling is that it can be made in advance and it will actually taste even better when you reheat it! Just make sure to use the stove not the microwave. Do you have a favorite weeknight taco recipe? We’d love to hear all about it! Leave a comment below or share your recipe with the #GeekEats hashtag! Pat tofu dry with paper towel. In a bowl, use a potato masher and mash tofu until it resembles scrambled eggs. Spray a skillet with cooking spray and heat up. Add tofu and Southwest Taco Simmer Sauce. Combine and cook until some of the liquid cooks off and tofu is heated through. Add more cooking spray to the pan. Saute peppers until just cooked (they should still be crunchy). Construct tacos with tofu mix, peppers, and garnish with cilantro. *The Geeks were compensated to facilitate this write-up; We were also provided information about Simply Organic Simmer Sauces. All opinions are wholly our own. View our Disclosure Policy for more info. I will be making this for Taco Tuesday!! Just went Vegan so this is perfect change to my Taco…that aren’t just beans. I’m working on eating less meat and it has been hard given that my kids love Taco Tuesday. Thanks for this awesome recipe, I can’t wait to give it a try!